Yesterday I conducted a little pie baking experiment. But first let me briefly tell you why. 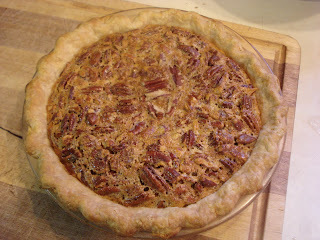 Thanksgiving, I made two pecan pies. One for my family and one for a friend. The one I made for us came out great. I used Pioneer Woman's recipe and ours came out fine. And since it was for us, I used a glass pie plate. 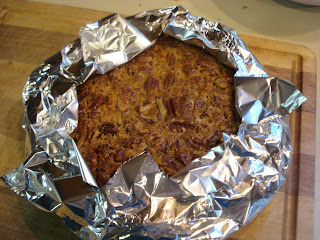 Then I made one for our friend using a disposable aluminum pie pan and his didn't set! This angered me greatly! I mean, hey, I bake for a living..I'm supposed to know better! 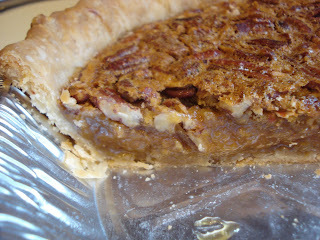 And pecan pie is like the easiest pie to make! So yesterday I decided to bake two more pies, one in the glass pie plate and one in the aluminum pie pan to see what happened...and why. I also chose to try a different recipe so I chose this one. This pecan pie recipe is quite a bit different from most. It uses way less sugar and a little molasses and flour! The result was a not at all sweet pecan pie which was a little strange ( with all due respect to this blogger) because part of what we've come to expect from pecan pie is the extreme sweetness and when it's not there it's..well..just strange! But wait! This pie was really delicious. Ok, back to the experiment. The result was that the pie baked in the glass plate was finished much sooner than the other pie. I actually had to leave the one baked in the aluminum pan in the oven about 20 minutes longer because it was just still too jiggly. 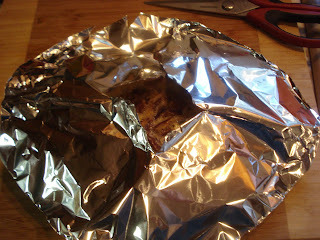 Then tear the foil open to expose the top of the pie while keeping the edge of the crust covered. See? I don't know about you but I had a dickens of a time keeping that darned foil in place everytime I tried to wrap strips around the crust. It never stayed in place for me! 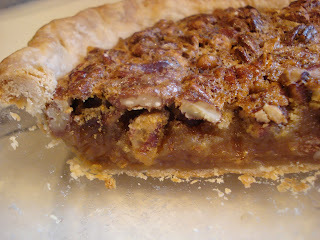 This is the pie baked in the glass pie plate. And here's the pie baked in the aluminum pie pan. 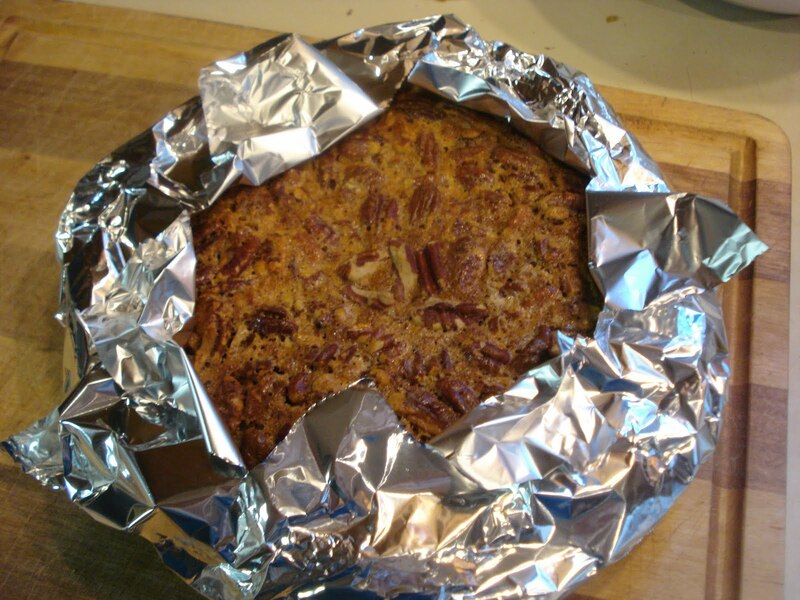 So what would happen if you set the disposable aluminum pan inside a glass pie pan to bake it? Hmm, I don't know! That experiment will have to wait til after the holidays! I really enjoyed that recipe as well, granted it was the only Pecan Pie I've ever baked for myself (I'm not a huge fan of "Super Sweet"). I believe it's the reflectiveness of the pan that is a good indicator of how well the pie will cook. The more reflective the less even the heat distribution and the longer it will take to brown because it's reflecting heat. Glass pie plates are apparently better for browning because it reflects nothing and distributes heat more evenly. Dark pie pans are next, but take a little longer to brown a crust completely. Granted I have never done side by side tests, this is just from what I've read over time. I figure it's better for me to spend my time trying to make a half decent pie crust, you know, since I can't seem to do that :). Yes, your explaination makes a lot of sense. I don't think I'd ever use a dark pie plate. Never actually owned one! I'm sure you're being too hard on yourself about making a good pie crust. A little practise. Maybe you need to conduct an experiment of your own! I make mine mostly in the food processor, using one of CI's recipes, then dump it into a bowl, sprinkle water on it and combine lightly with a rubber spatula. Chill and roll between plastic wrap. Give it a try. after searching for comparison between glass and aluminum pie plates I found your page. I was extremely pleased to learn about your experiment, it really did answer all my questions. the best part was reading that you ALSO had a hard time getting the foil to stay in place to keep the pie crust edge from burning. I have that trouble every time, but I thought it was just me. I think your idea, although simple is completely genius. I thank you now and I'm sure when I finish that step on my next pie I will be thanking you then.